My Latest Paintings Will Debut at an Upcoming Exhibition on “Ritual”! My Goddess Sculpture Makes Its Debut in a Chicago Art Gallery in 11 Days! This is definitely going to be a September to remember for me, and I’m very excited that my activities are located in the intersection of Art and Spirit. 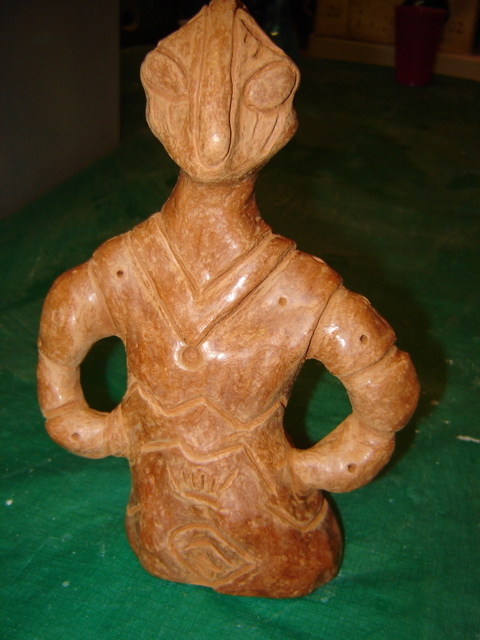 My latest terra cotta sculpture, a replica of a Neolithic artifact dating from the Vinča Culture of the prehistoric Balkans (c. 8,000-5,000 B.C.E.–actually, the very figure I made a replica of was unearthed by the late archaeologist Marija Gimbutas in the 1960s in the vicinity in Serbia where my mother hails from), will be making its debut at the upcoming exhibition The Spiritual Power of Art: Myth, Religion & Mystical Experience at the Life Force Arts Center in Chicago. The opening reception for the exhibit is on Saturday, September 12; it runs through January 5, 2016. My piece is entitled Velika Maijka, which is Serbian for “Great Mother.” Isn’t She cute? She’s currently adorning my household shrine to my female ancestral spirits. I’ll be bringing Her to the gallery on my birthday, September 8, as I’ll be helping out to install the artwork for the upcoming exhibit with other volunteers. This is the second sculpture of mine to be making its public debut. As with the first (also a goddess statue, incidentally), Velika Maijka won’t be for sale. I feel that, energetically, it’s important for pieces like this to have a dialogue with the public at large. As a newly appointed Artist in Residence at the Life Force Arts Center, I’ll be working in the year to come on bringing art-centric Pagan and polytheist rituals to life for anyone and everyone to enjoy and to help raise their vibrational levels while honoring specific Powers. I’ll be devising a ritual in particular that has Velika Maijka as its focal point, so stay tuned for details! Thank you, Jupiter in my Sun Sign, for expanding my creative horizons! Thank you, Ancestors of mine from the Land of the South Slavs, for instilling me with your wisdom and the call to safeguard our Mothers, the sanctity of soil, and the fragile blue planet we’re inhabiting! Živeli--To Life! Announcing the 22nd Annual Fellowship of Isis Goddess Convention in Chicago! Calling all Kemetic polytheists, Pagans, Tameran Wiccans, ceremonial magicians, FOI members worldwide, devotees of the Neteru of the Two Lands, and friends! All are welcome to the 22nd annual Fellowship of Isis (FOI) Goddess Convention in Chicago! It takes place Saturday, September 26, 2015, at the ManKind Project Building, 1900 W. Fulton Street, Chicago, IL 60612 from 10 a.m. to 7 p.m. (On-site registration begins at 9 a.m.) Mercifully, parking is free and abundant outside the ManKind Project Building–a rarity in Chicago’s West Loop neighborhood! Huzzah! Sponsored by the members and friends of the Chicago-based FOI Lyceums of Eleusis and Alexandria Mishigami; and the Iseums of Hathor-Neith-MahaLakshmi and the Rekhet Akhu; and the Dunsmuir, California-based Lyceum of Karnak; as well as by Chicago’s Life Force Arts Center, this year’s Goddess Convention is dedicated to the Great Ennead of Holy Powers. The Main Liturgy to be performed is the Priesthood Alchemical Drama of “Uranus, Coming Forth by Day”–the sixth ritual in the late Lady Olivia Robertson’s FOI clergy publication, Sphinx: Goddess Myths and Mysteries. It was deliberately selected not only for its themes of redemption and rebirth–ones that are very relevant in a strife-ridden world where many people are coming to consciousness about stepping up their service to their Powers and the planet as the latter continues to undergo great upheavals–but because it is solely oriented towards the Neteru of Egypt. The performance of this Main Liturgy is a sacred reclamation of “Isis” as a Holy Name of a Great, Ever-Living Goddess–not a besmirched, degraded, and hated name inaccurately assigned as an acronym to depict the egregiously evil deeds of terrorists fueled by a vicious Abrahamic zealotry. There is an urgency behind this reclamation; we love our Goddess in Whose Name our Fellowship is derived and anchored, as we love and adore all the Children of Shu and Tefnut. At this time of the Autumnal Equinox in North America, when energies are focused on giving thanks for a successful harvest and on preparing for the darkness to come, we honor the Powers from Whom manifold blessings flow. The Powers that sustain us. The Powers that light our way through the Duat. Editorial Note: This essay was first published in Pantheon, the official journal of Chicago’s Life Force Arts Center, a gallery and performance space dedicated to literary, performing, and visual arts rooted in spiritual expression. I retain all copyrights.